I know, it's a few months early for Halloween. I just couldn't wait. I'm having fun converting charts to row-by-row instructions, and then knitting them up to see how they turn out. I still can't knit from chart. :-( It's on my "to learn" list. Really!!! This pattern is inspired from BW3 p179. I saw it last year and had been meaning to knit it up, I just never got around to it until now. This cloth is about 9.5" x 8.5" (~24 cm x 21.5 cm). 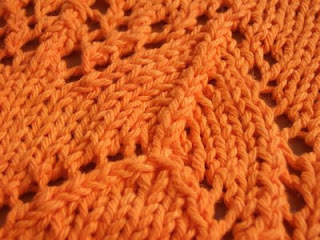 The Bat Cloth above is knit with S&C Hot Orange. 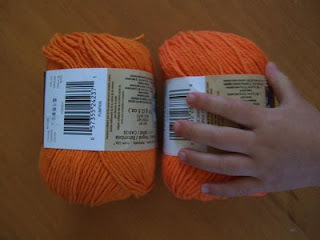 I have two orange yarns which look the same to me. I suppose there is a difference of shades between S&C Pumpkin (left) an S&C Hot Orange (right). However they both look the same when I'm rummaging through a box of cotton yarn. That's M's hand in the photo. She is usually pawing at anything I'm trying to take a photo of. 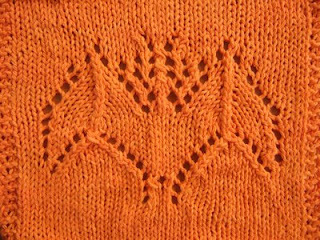 Bat Cloth pattern can be downloaded from Smariek Knits Yahoo Group. 10/12/07 Update: Trying something new here to improve pattern distribution. 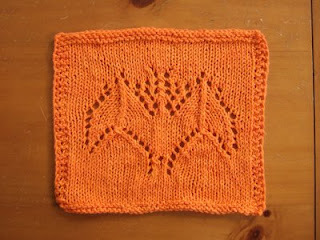 Bat Cloth pattern can also be downloaded by clicking on this link: http://www.box.net/shared/b70af9r379 . No registration required for this link. It's not too early anymore! Yay for festive oranges and spooky bats! It's fall! Hey, I was wondering if I could use your pattern for a group "Mystery" project. I run the blog and ravelry group, "Craft With Me" and we would like to do a challenge where we follow a pattern without using the picture to see how it works. I have a crochet pattern for them, but I don't knit yet, so I was wondering if I could post the instructions to this washcloth on my group, and possibly on my blog. It's an adorable pattern! !